I recently tested two new modules that I received from Chinese suppliers: a SD Card Module made by LC Technology (www. lctech-inc.com) and a DHT-11 Temp & Humidity sensor. This entry was posted in Arduino, Electronics, hardware, Programming, software and tagged Arduino, sd. Bookmark the permalink. I mean, do you connect directly to these ports? No resistors or anything? No resistors, only direct connections. If you have seen voltage dividers, they were probably to derive 3.3V from a 5V source. Note that I pull the 3.3V from the Arduino’s 3.3V output. Correction – for this test I pulled 3.3V from the power supply (see the green light on!). 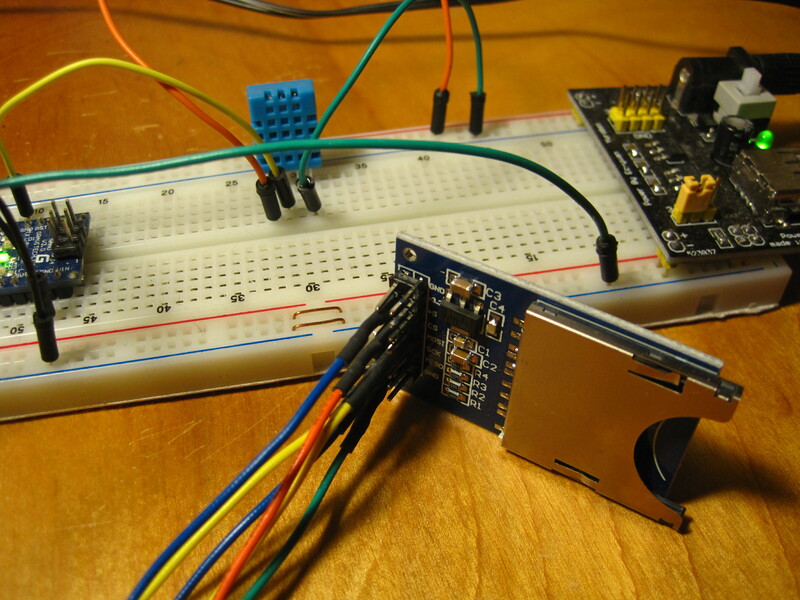 If you connect the Arduino via the USB, make sure that the Arduino ground in in common with the power supply ground. I used the 5v and connected directly to Arduino (no external power supply) and worked fine. I read that if you want to use the 3.3V you should use an external power supply, like you did, because Arduino’s 3.3V can hold about 50mA and the card reading can use more than 100mA. This module has two columns of pins. Which one should I choose? Or they are connected so no difference between left and right column? If you use separate wires all that matters is that you connect to the correct pins. The signal names are what is important: (SS/CS) “Slave Select”, (MOSI) “Master Out Slave In”, (MISO) “Master In Slave Out”, (SCK) “System Clock”. If you are using a cable, then, of course, the signal placement must match your cable’s requirements. Can you give another link for this program, please? This link is not available in my country, unfortunately. Pastebin.com is not accessible from Turkey? I added several other cloud storage sites – see if any of them will work. If none of them work, What similar text cloud storage is accessible for you? Thanks for the code, much appreciated.